One of the things you get with fantasy novels that you rarely find in sci-fi novels are maps. I’m not sure why this is so, but it is. Most fantasy novels, particularly those that sport the adjective ‘epic’ in their descriptions, include a map at the front of the book. I’ve often thought that it would be helpful to have more maps in sci-fi novels. Or least a few good floor plans so I would know where I am in the ship in question when I’m envisioning the story. So, since I was writing an epic sword and sorcery opera, I knew a map would be a requirement. It was also an opportunity. An opportunity to help myself get clear about the story and how it plays out across an entire realm. Which characters are where? Where do they travel to? How long does it take them to get there? In addition to helping me (and future readers) better visualize the story, it was also an opportunity to have fun making a map. Unsurprisingly, it became more fun than I anticipated. At first my idea had been for the map to resemble actual medieval maps. 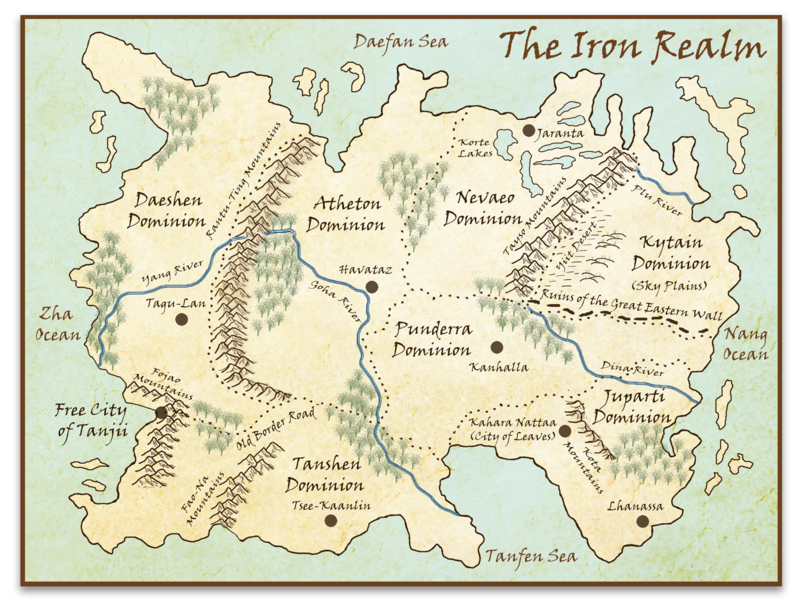 However the more I researched them, and the more I worked on creating the map of the Iron Realm, the more it became clear that a medieval style map wasn’t such a good idea. Firstly, the medieval maps simply are not very clear and easy to read. I needed something that would help readers situate themselves in a new world. Secondly, I found it too hard to achieve the medieval look artistically. I wasn’t getting the results I wanted from my map tests. Of course, I could have hired out the map making at this point, but that would have significantly reduced the amount of fun that creating the book could be. I like the art projects that are part of the book (there is also a painting and a page from the Codex included in the novel). My wife helped me design the maps and the art work (and the book cover) so it’s also an opportunity to spend some time with her making some art together. Eventually we decided on a look for the map that blended a feel of old and modern — hand drawing the outline of the continent and features like mountains, but using photoshop to paint in the forests and choosing a hand writing font for the text to keep it consistent and easy to read. The only real problem I encountered was the need to keep revising the map as I revised the novel, adding in mountains or moving cities to keep things consistent with the story. In the end I was very pleased with what we came up with. Hopefully readers will be as well. 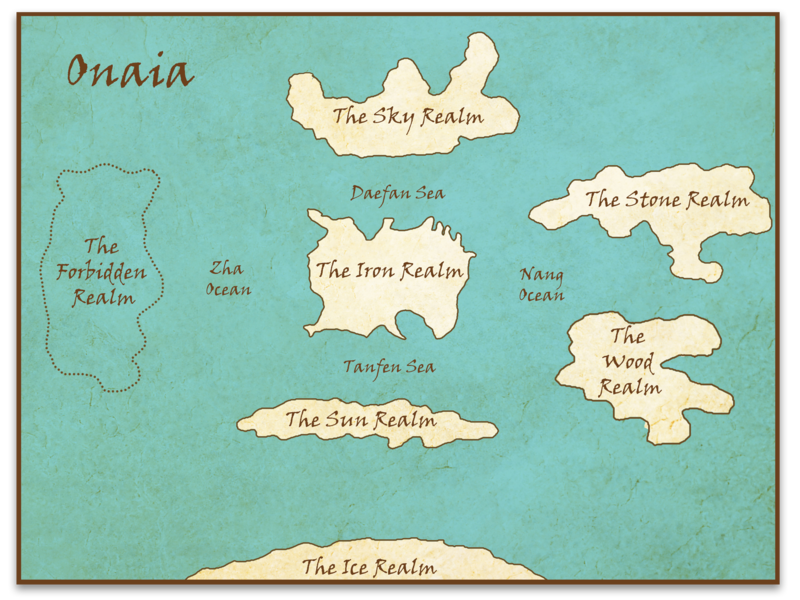 Naturally I couldn’t stop at one map, so I made simple map of the world of Onaia. And then I got it in my head that I needed a gazetteer to fill in all the details of the map. But I’ll explain that in another post, but you can check out an excerpt from it on the Maps Page.